Sandy Ingonish beach, a great place for a dip in the ocean. 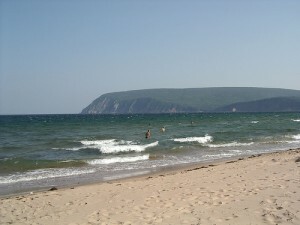 Set in the Cape Breton Highlands National Park and along the Cabot Trail, Ingonish Beach offers swimmers the delightful choice of either a dip in the ocean or in a freshwater lake. On one side of the sandy beach are the cooler waves of the Atlantic Ocean and on the other side a blocked cove offers warm swimming in freshwater. The beach itself is washed away every winter and then laid down again in by springtime waves. During the summer you’ll find a variety of services here, including toilets, a changing area, a playground, picnic tables, tennis courts and a restaurant stall selling snacks. Lifeguards watch swimmers in July and August.